We’re joined by our guest, pro pickleball player Tyler Loong. Tyler is going to help us walk through a great volley drill called Body Shot Volleys. This drill will help you with your reaction time at the non volley zone line. It will also help you with directional control on your volley and dealing with balls hit at your body by mostly learning to use your backhand. You also train yourself to hit through your opponent rather than always going around them. Each player will position themselves in the middle of the court at the non volley zone line. Each player will try to hit their volley at the dominant side hip of their drilling partner. If your drill partner is left handed then you will want to aim mostly at their left hip. If they’re right handed then you will want to aim mostly at their right hip. The dominant side hip is the hardest spot for a player to defend on their body. It’s ok and in fact preferred to move it around a bit so that both they and you can practice dealing with balls hit at various parts of your body. 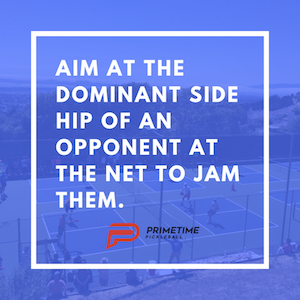 Keep in mind that both players are hitting volleys only so each player must strike the ball hard enough and high enough so that it reaches the other player at least waist high without bouncing. This is a cooperative drill (not competitive) so you will want to rally at a pace that both of you can maintain and as your reaction time and control improves you can up your pace. Remember, it’s important to get the ball all the way to them least waist high so you will have to hit firmly through the volley in order to achieve that. Practice this regularly, remain consistent, up the pace as your reaction time improves. Your hands will be lightning fast in no time.